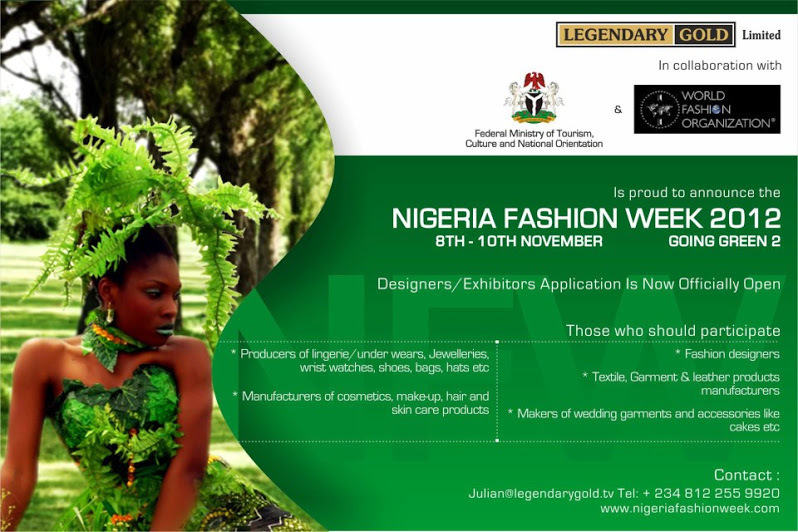 OVER 50 designers are scheduled to show their collection at the Nigeria Fashion Week (NFW) scheduled for the Muson Centre, Lagos from November 8-10, 2012. The event is organised by Legendary Gold Limited in collaboration with the Federal Ministry of Tourism, Culture & National Orientation and the World Fashion Organization. Some of the designers showing at the Nigeria Fashion Week include Frank Osodi, Zizi Cardow, Mai Atafo, Kiki Kimanu, Needle Kraft, Keto Couture, Modela Couture, Ogodor, Pages, Tesslo Concepts and so on. Some of the international designers expected are Adebayo Jones and Kosibah - London, Kipusa Clothing-Nairobi, Estella-Ghana, Alessandro D’amico-Milan, JAK Couture -Banjul, Omaks Designs -Washington DC, Frankoo Designs - Tanzania, Fred Eboka – Johanesburg, Nafytoo – Dakar and Trinite S.A, Bangkok among others. Some reputable international buyers will be at all the six runway shows to see what may interest them to stock in their shops around the world. They include the Milan based Camera Buyer Moda who runs over 120 shops in Europe. Also expected is the Sak Brand Group, which is one of the largest accessory companies in the United States. It has outlets in 4,500 departmental stores in the United States and is sold across the globe in 24 international markets. Some of its outlets include Macy’s, Bloomingdale’s, Belk, Neiman, JC Penny, Sears, Nordstrom, Jaks Fifth Avenue etc. Also attending is the Australian based TCF Global Group. They have some of the biggest marketing networks in Asia such as China, Indonesia, Thailand, the Phillipines and around the world. The theme of the NFW is Going Green 2. Since last year, in partnership with the Federal Ministry of the Environment, the NFW has been drawing awareness to climate change issues. To this end, the Going Green Collection was introduced. Most of the participating designers in the fashion week contributed garments and accessories made from recycled materials to this segment. This year, apart from the Going Green Collection, there will be a climate change awareness walk and tree planting exercise. The NFW 2012 kicks off with a networking cocktail to be hosted by Moorhouse, Ikoyi. It will be a session for all participating designers, international buyers, local and international press, event partners and top celebrities. Partners of this year’s event include Moorhouse, Rossonero Jewelry & Wristwatch, Chevrolet, Ibis Hotel, SAKR Power Group, Next Generation Luxury, Prime Chinese, Noah’s Ark, Europa Regina, Ovation International, City People, Encomium, Soundcity, ON TV and Spice TV among others.